Click here to read more and download our SWiS handbooks. I think we need social workers in schools to help look more broadly at children and young people in supporting them achieving the aspirations they have for the future. address the social determinants of health in specifically identified low SES schools. help pupils reach a higher educational outcome. So far, evidence from project outcomes suggests the SWiS approach assists school students to participate better in their learning. School students and staff have reported positive influences from having of social work students at the schools. Evidence shows that a consistent social work presence in the school is better for school students through ongoing support and relationships. 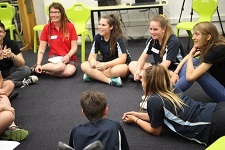 Originally, participating schools have been in rural or remote areas of New South Wales including: Armidale High School, Coonamble High School, Nambucca Heads High School, Farrer Memorial Agricultural High School, and Gunnedah High School. 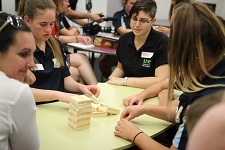 The program has expanded to include schools in the Central West of NSW, Western and South Western Sydney, and Wollongong. 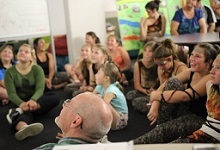 The SWiS program is well established in the Hunter New England Region of NSW. Student supervision in the schools meets university requirements. When the SWiS program is fully established, the aim is to have qualified social workers to supervise university students. The SWiS model, as a sustainable program, and is reliant on the availability of university social work students throughout the school year. We believe that by establishing long-term partnerships between UNE and other universities we will be able to continue to fill student placements, as part of the SWiS program, to schools in need. Social Work students have the opportunity to broaden their experience in the ‘outback’ and immerse themselves in the school and local communities. Local communities will experience the long-term benefits of the SWiS program. One long-term potential outcome of the SWiS program is to re-establish the Social Work profession back into NSW state schools. Additionally, the social work profession will be further recognised as being ideally suited to assisting school communities’ reach their full potential and capacity. Click here to read more and have the option to download our SWiS handbooks. Armidale Express, April , "More schools sign on to the UNE social work program." UNE News and Events, "Top marks for social workers." If you would like to speak with a SWiS representative please free to get in touch with UNE staff member Scott Gartshore, SWiS Project Officer.